B104 has another opportunity for you to win tickets to Chris Stapleton in Peoria! 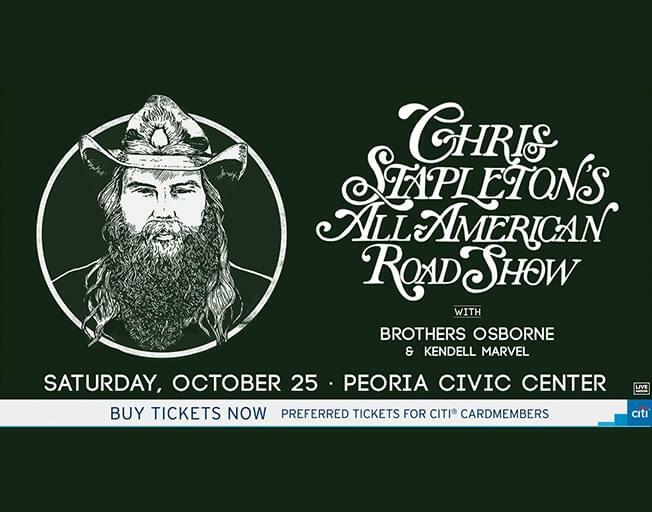 Chris Stapleton is bringing his “All-American Road Show Tour” with special guests Brothers Osborne and Kendell Marvel to the Peoria Civic Center Friday, October 25th. Get concert and ticket details here. B104 Insider Rewards members can ENTER NOW TO WIN A PAIR OF TICKETS. If you are not a member, Sign-Up Here Now so you too can take advantage of all the benefits including exclusive winning like this. It is FREE to be a member and only takes a couple of minutes to register. New members CAN win the Chris Stapleton tickets. We will announce the winner of the tickets Monday, February 11th. You need to make sure to Enter To Win by 11:59 PM Sunday, February 10th. Don’t miss this chance to win tickets to see Chris Stapleton in Peoria with Bloomington-Normal’s #1 Country, B104!